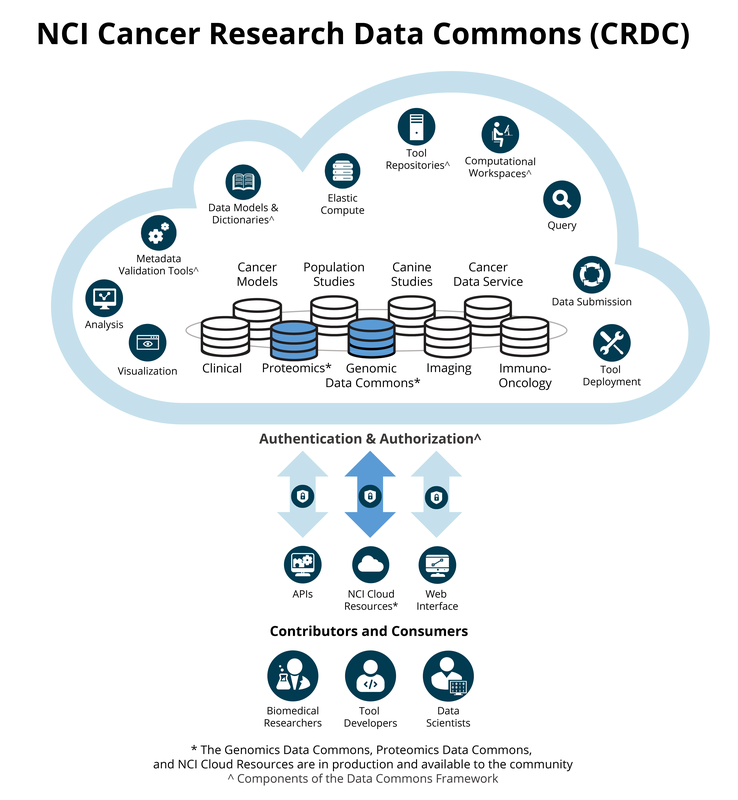 The vision for the Cancer Research Data Commons (CRDC) is a virtual, expandable infrastructure that provides secure access to many different data types across scientific domains, allowing users to analyze, share, and store results, leveraging the storage and elastic compute, or ability to easily scale resources, of the cloud. The ability to combine diverse data types and perform cross-domain analysis of large data sets can lead to new discoveries in cancer prevention, treatment and diagnosis, and supports the goals of precision medicine and the Cancer Moonshot℠. The Data Commons Framework describes the core principles and components on which the CRDC is being built. Cancer genomics cloud resources provide secure access to TCGA, TARGET, and other data along with computational power for analysis. NCI is developing a framework of core components that will provide common approaches to functions that are required across the CRDC. Nodes are repositories of related, harmonized, and accessible data, with an analysis infrastructure built for elastic compute capability and interoperability.